My latest PopMatters article is now live: Borderlands 2 and the Art of Support. 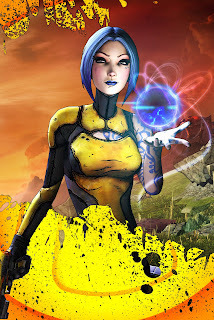 I am head-over-heels infatuated with Borderlands 2, in no small part due to a very intelligently designed support class - my role of choice in most multiplayer games. I would chat more about the role supports play in games, but I think the article speaks for itself in that regard. Besides, I am sure I will talk about support-role design again when the next class-based multiplayer game strikes my fancy. So I am actually a Borderlands convert. I tried a few of the characters out in the first game, just a few hours each, and it never struck me as entertaining, the guns missed constantly and for no clear reason. The environments were absolutely dry and monotonous, and the enemies came in three basic types and colors. No matter how much praise the game received from close friends, I never quite "got" what made Borderlands so compelling. In the sequel, Gearbox amends the aesthetic mistakes right away. The game starts on a snow-covered mountain - literally the antithesis to the desert flatlands I recall from the first Borderlands. While the game does feature deserts again and more than your fair share of skags, it also offers up a variety of biomes - from the wilds of the Wildern Preservation to fiery valleys. It is actually a joy to explore the world of Pandora - another one of my gaming interests. While the story does dip into the ludicrously dumb at times (oh, real bad on occasion), for the most part its actually compelling and funny. It also hides a lot of in-jokes and secrets throughout the game, which I would bother searching for if I didn't spend so much time in multiplayer pulling the slot-machine levers. If you can get a group of four friends together, Borderlands 2 reignites that fire for co-op experiences like few shooters today.